Keeper fluke love strip baits. Long, thin slices of sea robin, porgy, bluefish and legal fluke are favorite choices. As was widely reported last week, the Atlantic States Marine Fisheries Commission (ASMFC) on February 4, 2014 passed a proposal to manage fluke catches in NY, NJ and CT as a single region under a combined quota. In the amendment, an example of how the fishery might be managed was provided using an 18” minimum size limit, four fish creel limit and a 128-day season for all three states. In other words, the new limits have yet to be adopted which means that New York’s 2013 fluke regulations remain in effect for now. According to NYS-DEC spokeswoman Lori Severino, the size, bag and season restrictions will be finalized by a working group of biologists from the three states, using the latest data available. At that point, the states still need to go through their individual rule-making processes before the new rules actually take effect. The ASMFC ruling covers only the 2014 season. Next year, following an evaluation of this year’s results, the ASMFC will determine whether or not to continue this regional management approach. 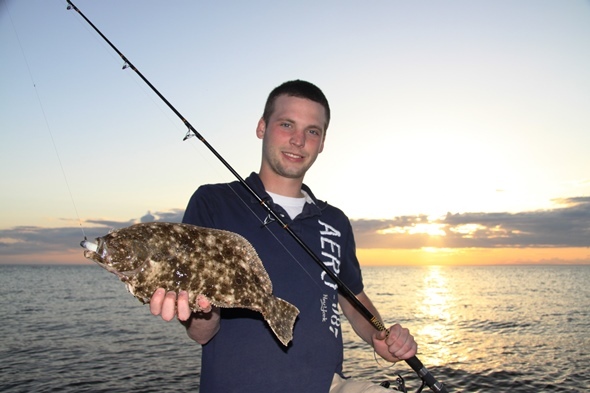 No matter the limits, anglers are free to release any fluke they want. This 7.5-pound doormat was weighted on a digital scale aboard the Shinnecock Star and was then released. The proud angler won the pool and still took home a limit of smaller fish for the table. Releasing trophies may help preserve the top end of the genetic pool. While it’s easy to give credit to the top politicians who spearheaded the campaign for fluke fairness, there were plenty of others working hard in the trenches and behind the scenes that also deserve a tip of the hat. 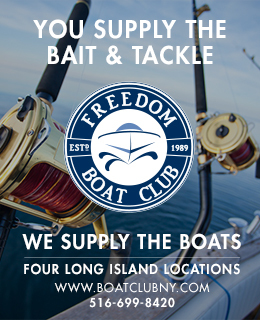 It’s been well documented that Governor Andrew Cuomo made the feds aware NY would sue if it did not get a fair share of the fluke quota going forward, and that Senator Charles Schumer introduced the Fluke Fairness Act to Congress which threatened legislation to resolve the issue. What you may not know is that Jim Gilmore, Bureau Chief of the Marine Resources Bureau for New York State DEC, coordinated DEC efforts, called the other state directors, and made an excellent presentation at the ASMFC meeting. 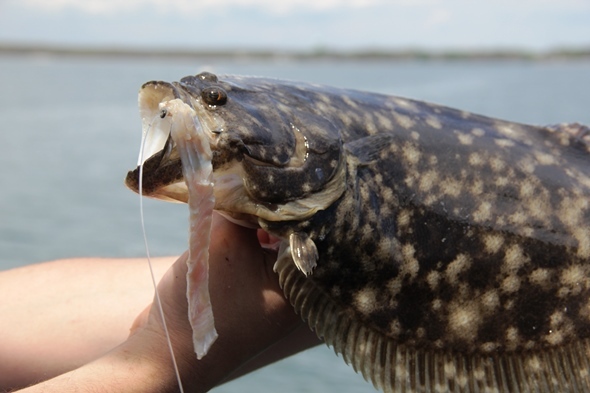 There are many others, of course, who deserve a pat on the back from New York’s recreational fishing community for pushing to establish regional fluke management. Suffice to say that all their hard work, plus new data and new math formulas that helped in interpreting the latest information, was enough to finally get the job done. Even from a New York perspective, New Jersey does have at least one legitimate beef on this vote: The region including Delaware, Maryland and Virginia is projected to get a 16-inch minimum size limit. This would lead to two legal sizes on Delaware Bay – the same basic problem that New York argued needed to be resolved for border waters with New Jersey. Numerous Jersey party and charter boats, as well as private boaters from Cape May to Cumberland county, fish Delaware Bay for fluke. “Delaware should have been included in the region with New Jersey,” said Fote. 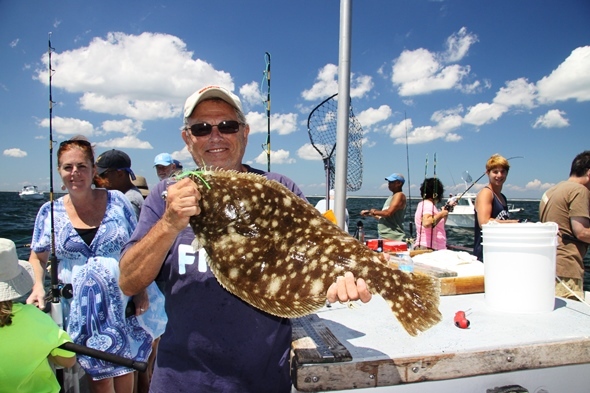 With regional management now approved for fluke, New York shore anglers are hoping a smaller size limit will provide a reasonable shot at catching a keeper. While the idea of regional management may be tough for some New Jersey anglers to swallow, there has been little overt push-back from recreational fishermen in the Nutmeg State. “Generally, I think, it’s good idea,” a said Dave Simpson, Director of Marine Fisheries for the Connecticut Department of Energy and Environmental Protection (DEEP). “A lot of our anglers have for a long time asked that we work to have similar or identical management measures to those of our neighbors. We’ve achieved that for our biggest neighbor, New York, at least for the 2014 season. I think an 18-inch size limit, which seems likely at this point, is reasonable. So for Connecticut, as in New Jersey, the new ruling shifts the problem of having two different size limits for fluke off the New York border and to another part of the state. This could have been prevented by brining Rhode Island into the region with NJ, NY and CT, which was one of the options considered by the ASMFC. After talking to anglers and representatives from both NJ and CT, one thing is clear. The fluke regulations for all three states will be identical in 2014, but the fluke wars are far from over.